Nursing is an under-rated and notoriously dangerous profession. Not only are nurses overworked, but they have to be such professional multi-taskers that common dangers are all-too-often ignored or take a backseat to life or death situations. For this reason, the nursing profession is consistently the top industry with the most serious job-based injuries. Simple precautionary measures can be taken in the workplace to reduce and offset the injury statistics, and a prime one can come from the nurses themselves: investing in proper nursing shoes. But doesn’t that really just pertain to women? After all, the media is full of horror stories about what happens when females wear the wrong shoes. While females do hold the majority of nursing positions, men also play a pivotal part in nurse-based patient care. Therefore, investing in and securing a proper pair of men’s nursing shoes is equally critical to your health and job security. 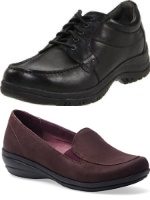 The following are among the best nursing shoes for men on the market today. As a modern offset of the Croc company, Keep is notorious for supplying hard workers with comfortable and durable career-based footwear. These attractive men’s career clogs let you keep your keen sensibilities while looking and playing the professional part. Keen Utility Mens PTC Slip on Work shoe comes in a black waterproof and stain resistant leather to ensure easy clean up and longstanding durability. Keen Protect design provides a larger toe box while protecting the toes and forefoot from unexpected work-related incidents. Lightly padded collar provides comfort upon entry, while the leather lining absorbs heat and moisture during your longest shifts. Keen Cush foot bed is made with a combination of polyurethane, cork, and memory foam to comfort, protect, and conform to your feet. And the Keen Grip sole meets or exceeds ASTM standards for oil and slip resistance. Brooks are known for their athletic excellence and professional protection. Nurses need specific footwear specifically developed to keep them on their feet during the most crucial moments. So if power and performance are important to you, these Brook Addiction walkers can make the difference between taking care of your patients or being one. In black or white leather or mocha suede uppers that give these nursing shoes a sneaker look, you can blend or stand out as much as you wish. Padded collar, tongue, and interior lining provide instant comfort and heat control right off the bat. Underfoot built-in arch support stabilizes low arches and helps control pronation concerns. The thick platform sole isn’t just visually appealing. It contains essential performance technology such as Brooks’ MOGO shock absorbing cushion midsole which channels energy throughout the foot, Forefoot HydroFlow fluid units for forefoot cushioning, Extended Progressive Diagonal Rollbar which aids in a smoother transition, and HPR Green durable sole which provides outstanding wet/dry traction and skid resistance. Mozo is a company that puts its customers first in modern and unique ways, such as by designing ergonomic professional footwear and providing the Mozo Fit System: a powerful self–adjustment option to allow customers to instantly get the fit they need within half a size up or down from the size they ordered. Mozo Mens Fozra Hospital shoes are an affordable and career-centered option for male nurses who need to be on their feet day in and out. Black leather uppers with elastic entry panels instantly mold to the outside of the feet. The entire shoe offers an ergonomic shape that acts as a second skin. Molded toe cap and internal gel insoles provide necessary under-foot cushioning and support. And spider traction soles ensure slip-free performance. This is considered to be an extra wide shoe, so if you’re medium width, consider ordering down half a size. Professionals know Merrell produces quality footwear. So it should come to no surprise that when medical fields call for the best in nursing shoes, Merrell answers with their Men’s Jungle Moc CT Slip-Resistant Work Shoe. In black or brown waterproof leather uppers, these stylish slip-on’s can work with a variety of uniform needs and take you right into post work socializing without so much as a shoe change. The style features a composite toe, which I think would be an overkill for the medical field and more suitable for a work site. But you can make up your own mind about its suitability for your needs. Dual gore stretch sides allow easy entry and exit. Comes with a breathable mesh lining to keep feet cool and dry. Plush comfort foot bed is removable to permit your own orthotics, while built-in air cushioning within the heel absorbs shock and produces extra bounce and comfort to avoid common foot ailments. SureGrip anti-slip sole meets or exceeds ASTM F1677 slip-resistance testing to ensure these nursing shoes do their job so you can do yours. Male nurses need to be on top of their game during every shift, and Merrell Mens Encore Gust Slip on shoe helps ensure that happens. These modern low-rise clogs separate the men from the boys in smooth brown or black leather uppers that compliment an assortment of professional style needs. Thick, circular padded collar provides instant comfort upon entry, while the polyester mesh lining is treated with Aegis antimicrobial protection to keep feet cool, dry, and odor-free. Ortholite foot bed supports and comforts day in and out, and it’s completely removable to permit your own orthotics if needed. Stability and shock absorption is performed effortlessly by way of the midsole air cushioning and nylon arch shank. And the ultra flexible Encore sticky grip sole ensures slip-free protection while reducing leg fatigue and foot stress.